Combine flour, bicarbonate of soda and sugar in a bowl. Make a well in centre. Whisk egg, buttermilk and butter in a jug. Add buttermilk mixture to flour mixture, then stir until just combined (don't overmix). Melt a little of the extra butter in a large frying pan over moderately low heat. To cook pancakes, pour 3 x cup measures of batter into pan. Cook pancakes for 1 minute or until golden underneath and bubbles appear on surface. Turn, then cook for another minute or until golden. Transfer to a heatproof plate and cover to keep warm. Repeat with remaining batter to make 12 pancakes. 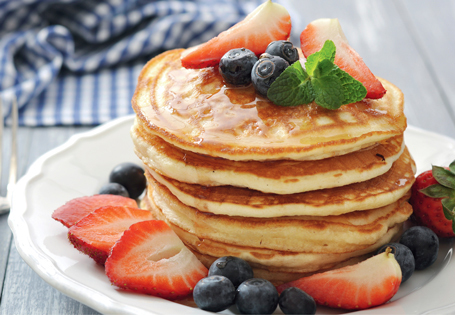 Top the pancakes with the caramel topping, a few blueberries and chopped strawberries. Serve with ice cream and extra blueberries and strawberries.